When last we saw our heroes, they had just gone for a Sunday afternoon nap. Upon awakening, Tom and I went downstairs and started on dinner. This took a while, because we were making Donald Link's Fried Chicken and Andouille Gumbo from scratch. First, had to pan fry/brown the chicken pieces. Then, add the flour into the chicken frying oil and make a roux. Which took over a half an hour. But once that was done, just needed to integrate it into the chicken broth, add the trinity and spices, and the chicken to cook for a few hours! Then add andouille... and then fry up and add okra. I was told it was excellent and delicious, but, you know, my audience was my mom and my husband, so they might just be a little bit biased. Having learned my lesson from the previous day, when early rising and late(ish) brunching reduced Joan to eating the lemon wedges brought for her iced tea at Coquette while waiting for the bread basket, I ran out to Freret Street Po-boy and Donut Shop and picked up a selections of delicious housemade donuts (and an apple fritter). This was to tide us over until our much-anticipated lunch at Commander's Palace. We got gussied up and presented ourselves at the Palace, and were seated in the main dining room. 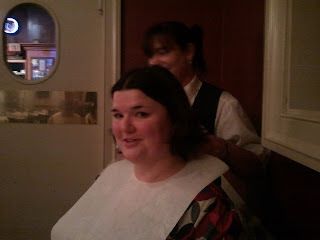 The service was wonderful, of course, and the food was amazing. 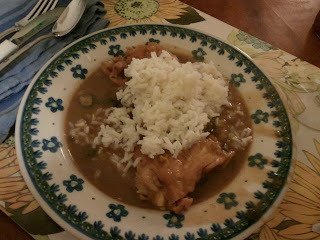 Mom started with the seafood gumbo and then had the paneed chicken and crawfish. 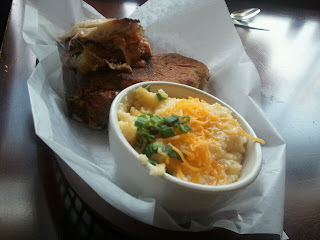 I had the shrimp remoulade salade and then the tasso henican. Tom had their "heart-healthy" Oschner meal, which just so happened to sound delicious and was quite good. The starter was a gazpacho, followed by a mushroom coated gulf fish with roasted vegetables, and finishing with a blood orange sorbet. Mom and I split the bread pudding souffle of course. 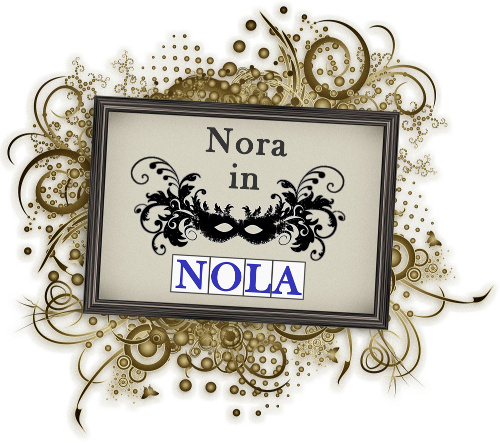 And do not forget the 25-cent martinis! Mom had 2, I had 2.5, and Tom had .5 (he finished my gin martini.) Yum. 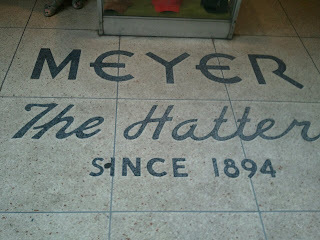 After lunch we headed downtown to find Tom a suitable hat for the summer. 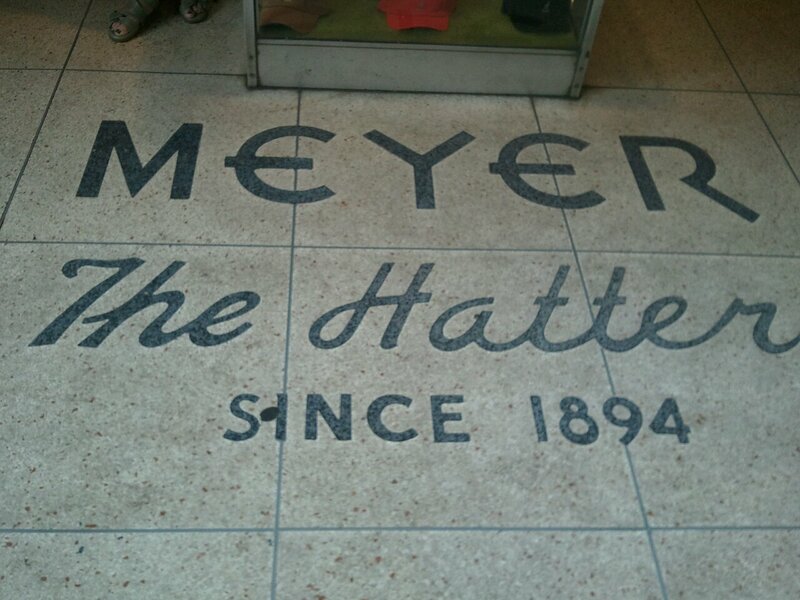 Tom had previously admired an acquaintance's hat and got the tip to check out Meyer the Hatter, located on St. Charles at Canal. After trying on dozens of hats- the ones I liked, he hated, and the ones he liked, I hated - Mom spotted the perfect hat on a far up shelf in the back of the store. Tom tried it on, and it fit perfectly, and looked quite dashing! It's a relatively short brimmed hat, made of a hard-ish coconut material. Hard to describe but will post pictures in the near future. Definitely his hat, though. After hat shopping (with a stop at the Cochon Butcher to pick up a copy of Donald Link's cookbook for a newly smitten Mom), we settled into our now-customary Monday afternoon nap. Woke up for cocktail hour and Scrabble playing, then headed over to Pascale's Manale for dinner. 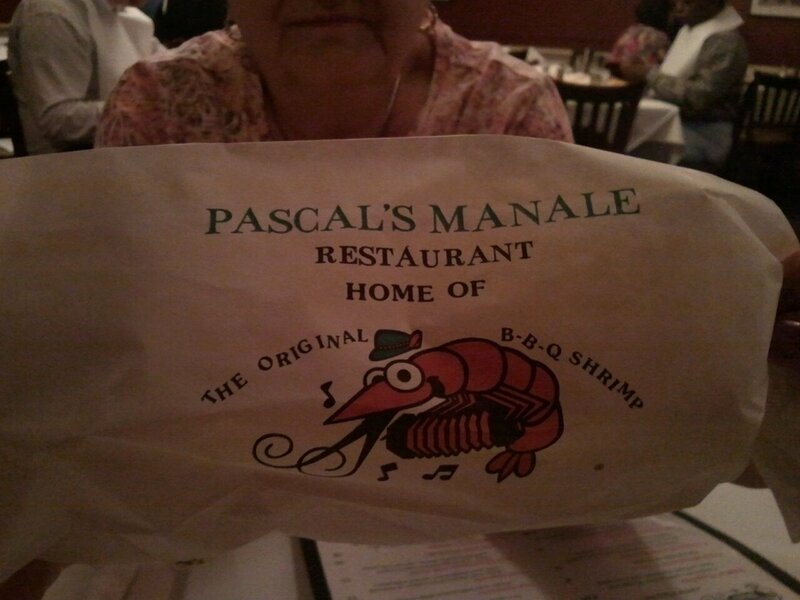 Pascale's is an old school Creole-Italian joint that claims to have invented the BBQ Shrimp and takes pride in its oyster raw bar and traditionally prepared Oysters Rockefeller. After we had a drink in the gorgeous old bar, we were seated and promptly taken under the wing of our fabulous waitress, Wendy. We decided to do a half and half dozen of the Oysters Bienville (with a crab and shrimp stuffing, I think) and the Oysters Rockefeller. Both quite delicious. For our main dishes, Tom and Mom had fish, and I had the BBQ Shrimp, of course! They were big. They were messy. They were delicious. They came with a bib. Mom didn't care for her fish, it was overcooked, so she sent it back and they took it off the check. Unfortunate, but handled well enough. We had key lime pie for dessert, which was creamy and delicious. Despite the few problems, it was a wonderful time. 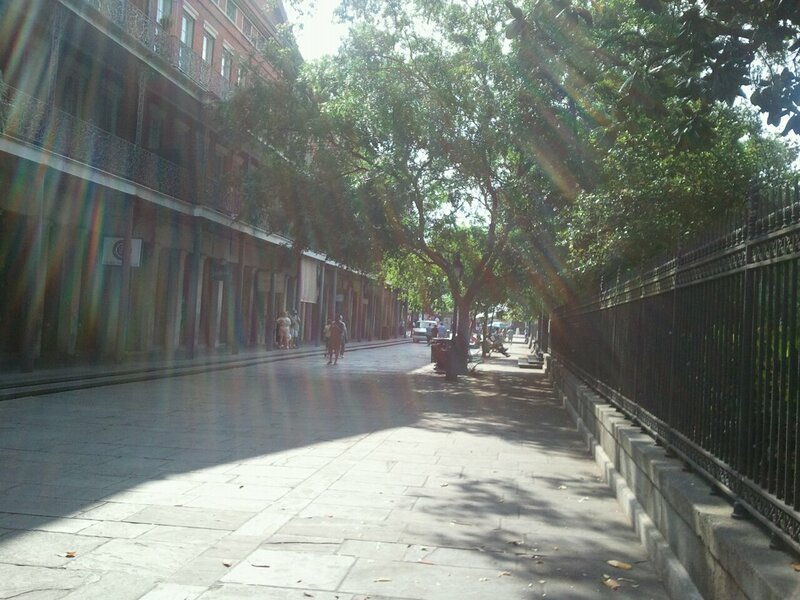 We dropped Tom off at work, and headed to the Quarter. 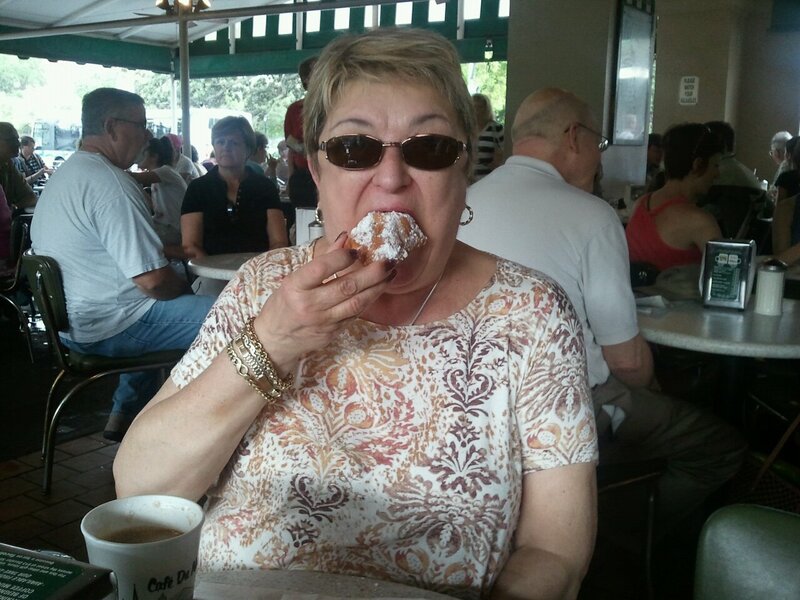 I dropped Mom off to stand in line at the Cafe Du Monde while I parked the car, only to park and return to find that there was no line, and she had ordered and gotten the food in that time! Beignets and cafe au lait, yum. 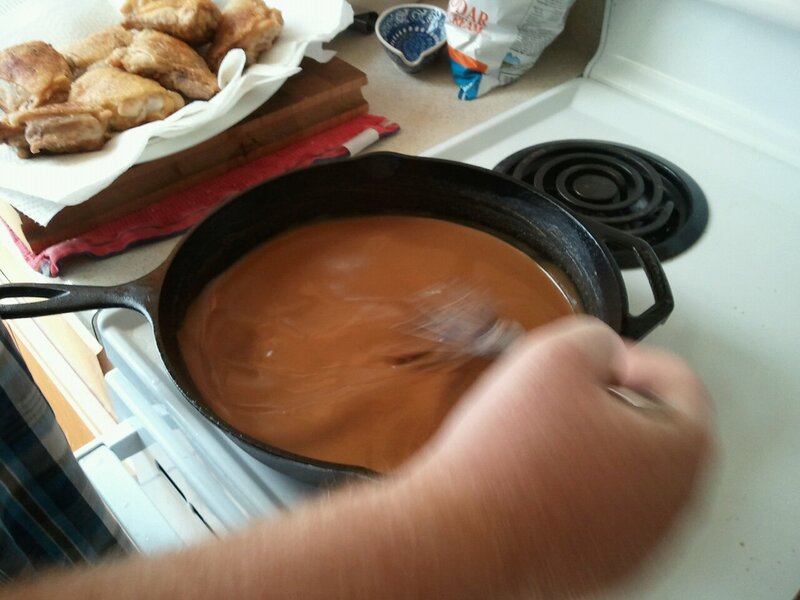 Afterward, we drove to North Peters to get some pralines (and other stuff) from Southern Candymakers. Mom ended up getting a variety pack of pralines, turtles, and toffee. Also some Crystal hot sauce (which they wrapped up awesomely to protect from breaking) and file powder. Then we drove out over the Industrial Canal into the Lower Ninth, and went to the Village, where Mom met Mack and we both met the new Village dog. 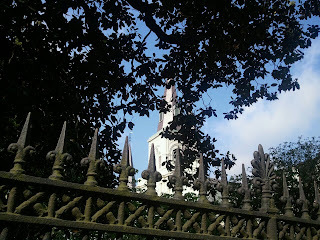 We chatted for a while and I showed Mom around before parting ways and heading back over the Canal to Canal Street, where I turned to bring Mom up to Mid-City. We went to my office and cruised through City Park, and then it was time to pick Tom up for lunch at J'Anita's. I'd promised the chefs I'd bring Mom by, and we tucked into a hearty lunch- Mom with the Swamp Reuben, me with the Chicken & Tarragon Salad sandwich, and Tom with the special of the day: the Meatloaf Sandwich. It was really, really good and I suffered from Sandwich Envy. After the naps de rigeur, Mom asked if we could skip going out for dinner and have takeout at home. She was craving Indian, so that's what we did- stayed home with takeout from Nirvana. Then early to bed, because it was early to rise the next morning, to get Mom to the airport for her morning flight. So that's about the gist of it! We had a great time with her, and she seemed to have a great time with us. I hope we showed her to wonderfulness of New Orleans and why we made the puzzling decision to pack up and move here. 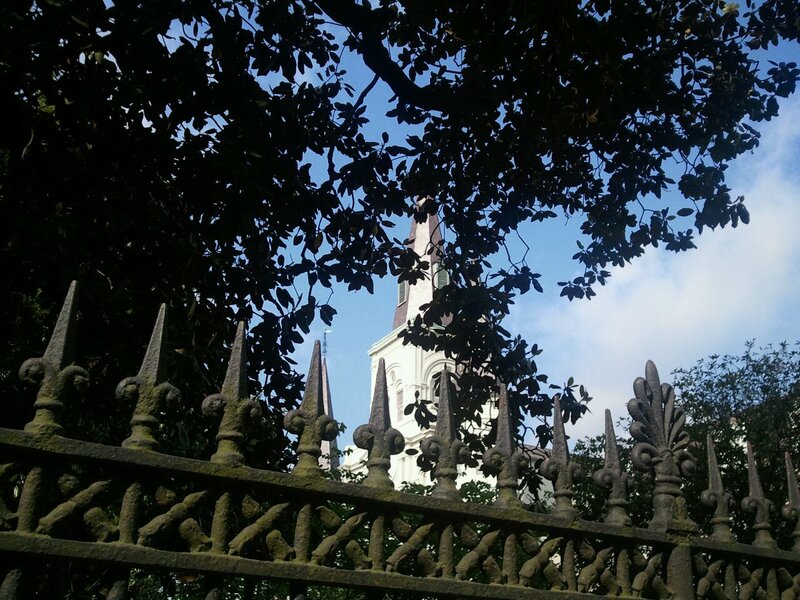 I invite all others who have the same puzzlement to come down for a visit and let the city answer your question. Seriously, I'm thinking of coming back for Decadence again, but this time I will have to eat all my meals with YOU! !